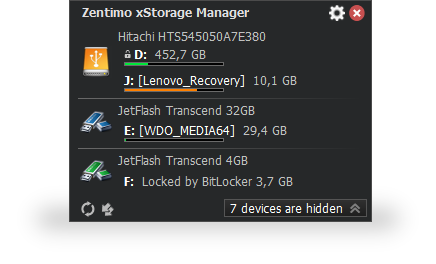 Zentimo xStorage Manager offers a new way to manage your USB & eSATA devices. While it solves many removable drive related problems in Windows, it also gives more control over your external devices and just makes working with external drives fun & pleasure. The program gives a highly customizable menu to manage external devices, displays what programs prevent stopping a device, speed ups your work with hotkeys, hides drives of empty card reader slots, allows to return a stopped devices back. Besides it lets you automaticaly run any programs on device connection\disconnection, speed test your drives, manage portable apps, has an enhanced drive letter management tool, integrates fully with TrueCrypt and much more.